IPTV guides are rare on the Internet. You can access dozens of Internet TV guides which recommend services like Joost, Bablegum or those Asian P2P Internet TV clients such as Sopcast or TVUPlayer. The difference between IPTV and Internet TV is that IPTV is normally supplied by a broadband operator using a closed network structure. The most popular IPTV service that got worldwide coverage last year was ABC's IPTV service that streamed popular TV shows such as Lost or Alias to United States citizens. Update: The situation has changed in recent time with the rise of Netflix and Amazon Prime, and other network-independent TV streaming solutions. The services have become more readily available, even outside the US. The service uses an IP check to determine whether the show can be streamed to a client. You can generally divide the services into three different types. The first are free services for users that have a certain IP range who can view the shows on a website. The second is a subscription based service where users from selected countries can view shows and events on a website and the third is a free for all approach where everyone in the whole world is allowed to watch the shows. The following IPTV guide is mainly useful for US citizens who currently reside in the United States. The website Daily IPTV compiled a list of "100 of the best TV channels the Internet has to offer". The channels are divided into categories such as Sports, Movies, Television Networks and Comedy. Especially the Sports category has some advanced looking services that offer paid access to many major sport events and leagues including NHL, MLB, Golf and Tennis. Most can only be subscribed to by US citizens but some are free for all. Check the IPTV guide out here. Update: The guide is no longer available. All the sites that provide you with guides are not really that thorough, at least not those sites that search engines lists on their first pages. For US American TV shows, it may pay to visit TV.com which provides you with information about current and upcoming shows. 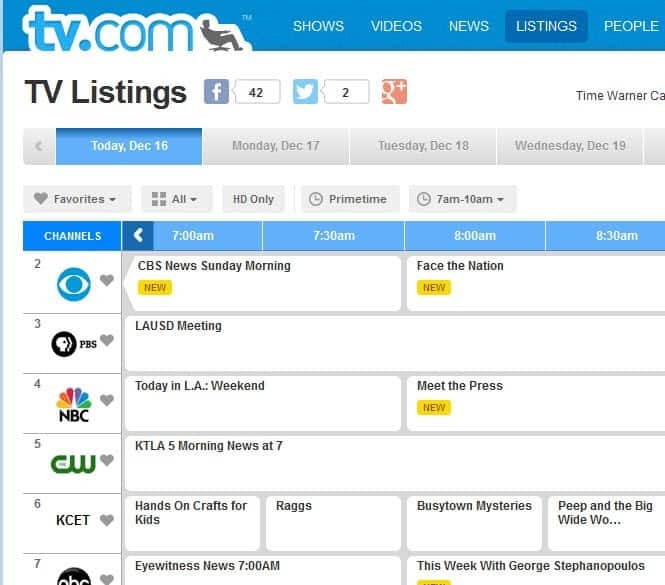 Another site offering TV listings is Zap2it which focuses on US TV as well. When it comes to streaming services, you may be interested in sites like Can I Stream It or Just Watch which provide you with information about movies and TV shows, and which streaming service offers those.